Athens is one of those cities where the past and present intersect. You can easily visit historical sites while also hitting all the latest shops and clubs. The neighborhood of Monastiraki in Athens is one of those areas in the city where this is especially true, and it is filled with some iconic landmarks. There is enough to do here to spend at least a day seeing the sights around the area. 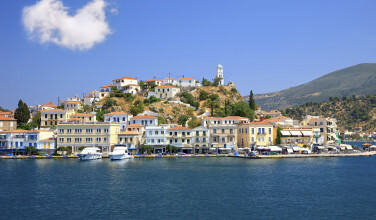 Learn about the attractions that Monastiraki has to offer below. The Roman Agora offers the visual remains of an ancient marketplace. View the structures and picture when people used to come to get food. Admission is free for students and children. Being accompanied by a guide when you tour is highly recommended as there is not much written about the site on the grounds. 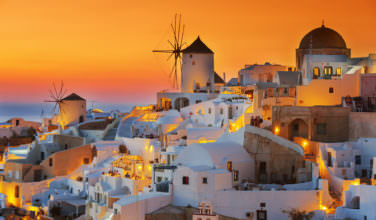 A plus to this attraction as it is very close to the Monastiraki metro station, making visiting easy. This church has stunning architectural features, and is close to the main Monastiraki square. Step inside and experience the spiritual, peaceful environment. The church is Orthodox, and services can be attended. No matter when you visit, make sure you dress modestly because shorts and miniskirts are not allowed. In 1972, the Ministry of Culture declared Agia Irini Church as a monument of interest. This church is not-to-be-missed on your tour of Monastiraki. If you are the type of person who could spend all day at a library, make sure you check out the Hadrian Library. The space was damaged in 267 A.D., so only the remains are visible, but you can appreciate what has stood the test of time and picture yourself reading an ancient text. If you have the time to visit, take a quick tour of the structure. Get the multi-spot ticket. 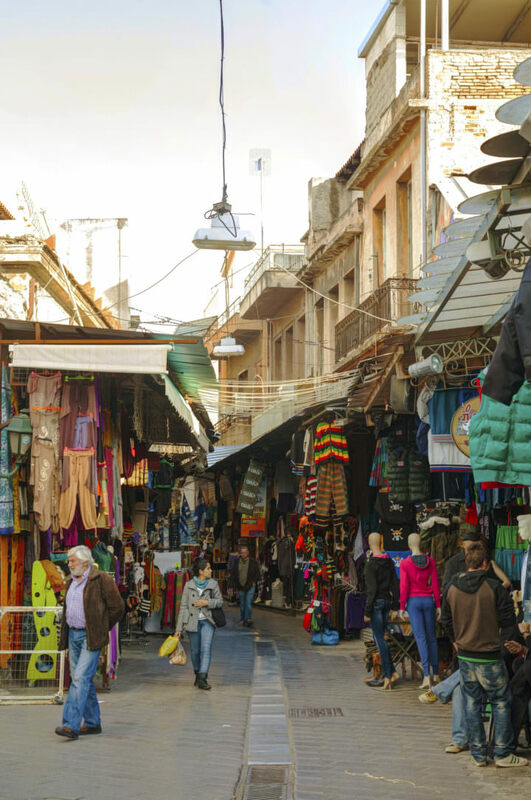 Located at Avissynias Square, the market at Monastiraki is one of the most famous in all of Greece. Get there early on a Sunday, when the most wares are sold, well before 11 a.m. You might have to dig through the piles of cheap goods, from clothing to trinkets, to find gems. Vintage wears and pearls can be found if you look hard enough. If possible, try to compare what is for sale and try to haggle to get the best deals. You could spend some time wandering the stalls or browsing. Go during the daylight hours to get the widest selection. Many restaurants, including Oraia Penteli, are nearby. Dine on moussaka, spinach pie and fried cheese, while you receive attentive service. Listen to live music and relax after your shopping spree. Enjoy a drink in the garden for picturesque views. If you opt to eat in Monastiraki, check out the area near the Agora for cheap souvlaki and gyros. 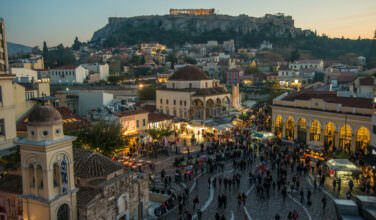 Take time to explore the lively neighborhood of Monastiraki on your trip to Athens. You will be sure to have a memorable, unique and unforgettable experience.